I’ve had a chance to try out Refract’s insanely fun and challenging arcade racing game, Distance. This is a survival racing game that marries exploration with arcade racing as you figure out what happens in a futuristic city where deathtraps lie around every corner. 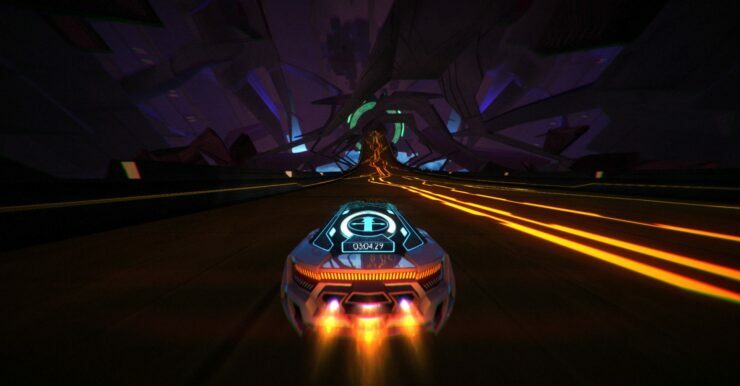 Refract is hoping to really nail the spiritual successor of Nitronic Rush while expanding on the cool-looking world and white-knuckle racing. My PAX East demo had me try out the Adventure mode. I started off by speeding down an easy to navigate course that gradually introduced new dangers for me to avoid, like saw blades or laser grids that could slice your car to colorful little bits. The driving felt great with responsive controls, especially when things like flight or driving on the walls get incorporated into gameplay. You’ll need to survive against the perils of the road until you make it to a checkpoint that restores your car back to its former glory. There’s something kind of amazing about driving your car with the top half of your car missing courtesy of a well-placed laser. As the stages progress, expect to suddenly switch between bobbing and weaving through obstacles to transforming your car into a flying machine. You can’t stay airborne forever, though, so don’t just think you’ll fly over any and all trouble that may come your way. More advanced stages end up turning almost into these high-speed dynamic puzzles. My favorite parts were suddenly finding myself riding upside-down trying to thread the needle through a series laser grids. At these moments you’ll hold your breath and end up feeling amazing once you miraculously make it through. Distance has great visuals that feel like a mashup between Tron and an electronic music video. It’s fairly easy to get distracted with how alive and neon the world is and there were one or two times where I missed a jump because I was too busy admiring the visuals. What makes the game truly feel alive is its pulse-pounding soundtrack. I would love to see how this game looks in VR, considering how awesome the first-person cockpit view is even during normal gameplay. Refract didn’t go into much detail about the story for Adventure Mode. My time with the Distance demo ended with a surprising twist that borders a bit on horror, with ghostly hallucinations appearing on the road for a genuine and unexpected scare. I look forward to seeing the direction the story will take, since you don’t really see many arcade racers try something like this. At PAX East 2017, Refract was also showing off the local multiplayer with four players competing against each other in an arena stunt mode. Think of it like playing Tony Hawk, except the skateboarders are actual cars. We also spoke about other modes, like 12 player online Sprint and Reverse Tag. Speaking of online, a level editor was released and it seems like the community has taken a shine to it with creating and sharing almost 2,000 levels. We’ve involved the Distance community right from the beginning since it was community funded on Kickstarter. We monitor our forums and are actively on social media channels such as Twitter and Facebook. Community members can also use the level editor to create and share their levels on Workshop. We’ve already seen and played some great community created levels and we’re excited to see what’ll come next. Distance is still on Steam Early Access, but seems already well polished and tries something you really haven’t seen before. It’s easy to see someone losing hours getting sucked into Distance’s stylish world when it comes out on PC and PlayStation 4. Refract is targeting a release in late 2017 on both platforms, by the way.